We learned from my husband’s officemate that the school near our place is holding summer classes for young children. Since Justin already knows how to count 1 to 30, identify all but five letters of the alphabet, distinguish between shapes, and sing some nursery rhymes, we decided to let him have his first taste of school. Parents are allowed to observe first how their children would react to being in a classroom setting, so that’s exactly what we did yesterday, the first day of summer classes. 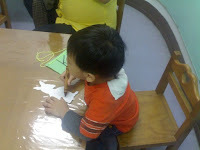 Justin was initially placed in the classroom for nursery students because of his age (2 years and 9 months old). He was later transferred to the toddlers’ room for reasons only the teachers knew. I was guessing it’s because we haven’t paid yet. How was Justin’s first day of school? When he was in the older kids’ room, he immediately got hold of toys that were lying on the table. He wasn’t intimidated by the presence of the other kids. 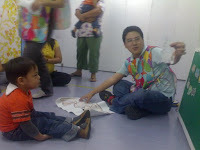 In the toddlers’ room, he participated actively in the singing, dancing, coloring, eating, hand-washing, and storytelling that went on for two hours. He did not want to go home when it was dismissal time already. Justin was too keen on playing and has to be reminded by the teacher often that it’s not time to play yet. His fondness for play has caused him a lot on his first day of school because when he was reaching for a toy truck, it slid and his face ended up flat on the floor. He bit his lower lip in the process, and it bled profusely. He also has one bad habit when playing. If he likes a particular toy even if his classmate is already playing with it, he would just take it without permission. He feels he has a right to take every toy he pleases. I had to be constantly by his side to prevent him from doing this. According to Teacher D., this type of reaction is normal for kids his age. I really wish he outgrows this negative attitude soon. We’ve been going to this school for two days now, and so far, so good. Justin is still excited to go to school every day. I hope he finishes his five-week summer class. This entry was posted in Nursery, School, Summer Class, Toddlers. Bookmark the permalink. wow! you’re lucky that you’re son is so into it, and very obvious that he enjoy school a lot, he love learning.